I’m sure some of the reason behind this stems from the need to assert administrative control, assess taxation and clarify property rights across a bewildering profusion of boroughs, wards, parishes, liberties, districts and councils. Part of it, certainly, arises from the way in which successive mobility technologies have allowed the city to colonize the land — sprawling its way across terrains and conditions, levering itself ever outward via rail lines and motorways, until the area within the ambit of the M25 subsumed a not-inconsiderable chunk of the British landmass. But a great deal of this history is driven by history itself. Over the two thousand years of its documented existence, the physical fabric of London has blithely folded everything from animal trails and Roman roads to the Abercrombie Plan and the Westway into its network of connections. As a result, this is, at its core at least, a topologically ornery city. It is a place threaded with byways that admit to no obvious exit, that continue past a nodal point only under some other name (and therefore bear multiple designations within the space of a few dozen meters), that deposit the pedestrian somewhere, anywhere else than wherever reason and intuition suggest they might. Saffron Hill, Newman Passage, Johnson’s Court, the increasingly (and, it must be said, distressingly) salubrious alleys of Soho — you can walk these thoroughfares half a hundred times, and still not quite remember how they link up with the rest of the city. Or even, necessarily, how to find them again the next day. At the same time, of course, London is a city of roundabouts, flyovers and gyratories, of circuses and viaducts and junctions — a city that was already thoroughly reticulated by bus routes and Tube lines before anyone now living was born. With each new layer, its complexity increases in a way that is not additive, but multiplicative. But if all of this is undeniably the case, it’s also true that you can wake up one morning to discover that the tramways have been pulled up, that Charing Cross Road no longer quite connects with Tottenham Court Road, that someone’s proposing to turn Elephant & Castle roundabout into a peninsula. The confoundments threaten to spiral out of control. So whether they avail themselves of one via the enameled surface of a Legible London plinth, an app on their phone, or for that matter the Knowledge so splendidly immanent in the comparably complex network of neurons in a cabbie’s head, the would-be reckoner with London needs nothing so much as a chart, a guide. A map. So equipped, one can finally negotiate the city with relative ease. But navigation is by no means the only thing we use maps for. It’s long been understood that cartographic tools can help us better comprehend some state of the world, and even allow us to make effective interventions. As it happens, this kind of spatial analysis was born right here in London. 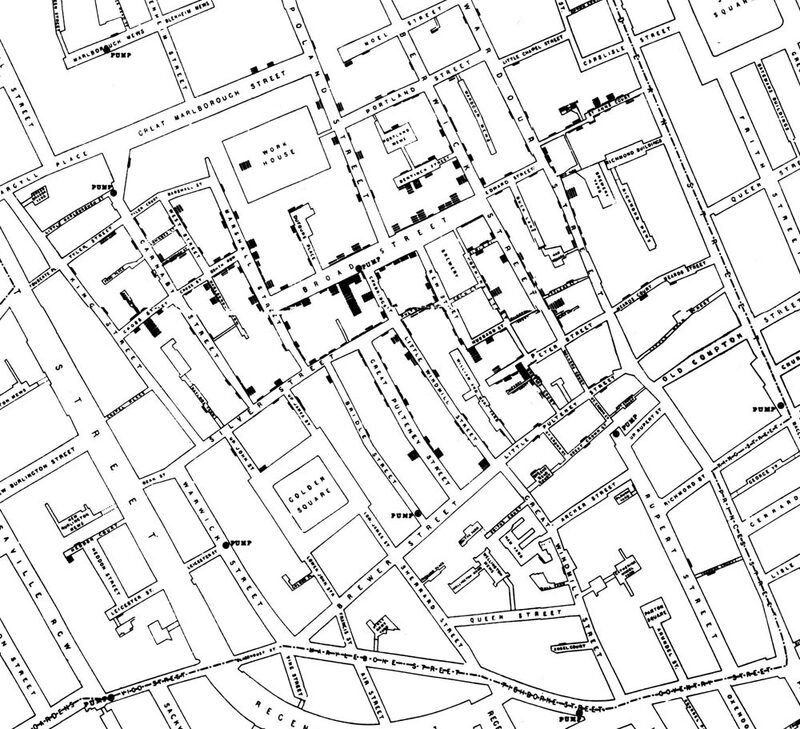 When John Snow tallied deaths in the 1854 Soho cholera outbreak on a map, he made manifest a pattern that had previously eluded even the most conscientious ledger-based tabulation: that peak mortality clearly centered on the Broad Street water pump. Armed with this evidence, Snow famously petitioned the parish Board of Guardians to remove the pump handle, which they did the next day, stopping the epidemic in its tracks. It was a landmark moment for both epidemiology and geographic information systems — and it would not be the last time in the history of London that a map proposed an intervention. In their way, Booth’s maps were as effective as Snow’s in driving change in the world. The response, when it came, may not have been quite as elegant or as precisely targeted as the removal of a single pump handle, but its impact was undeniably felt at a larger scale. When Parliament authorized the first Old Age Pension in 1908, Booth’s work was widely regarded as having been instrumental to the effort aimed at securing its passage. Here we get some sense of the power of a geographic data visualization. By judiciously folding complex urban dynamics back against the ground plane, maps like these help us comprehend circumstances that may well be transpiring beneath or beyond the threshold of unaided human perception, in space or time or both. They are, quite literally, consciousness-altering. 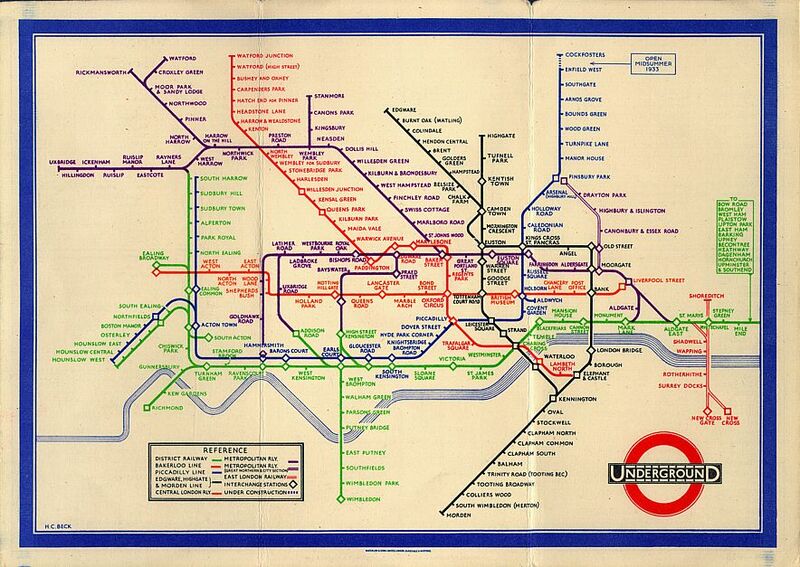 In all the long history of mapping the great metropolis, though, it’s arguable that no single map did more to change the ordinary Londoner’s perception of urban space than Harry Beck’s original Underground diagram of 1933. In reckoning with the burgeoning complexities of a then relatively new addition to the city’s network of networks, Beck’s map emphasized the experiential truth of urban space over the geographically literal. As anyone who’s ever hoofed it between Angel Station and Old Street can tell you, the overland distance between any two contiguous stations bears only the slightest resemblance to the proximity implied by the Beck schematic and its many descendants. But these gross displacements, however grievously they might afflict the small but vocal contingent of people who care passionately about such things, are entirely beside the point. For all its compressions, expansions and improbably crisp 45-degree angles, the map is impeccably accurate in reflecting the way Tube riders actually perceive the space of the city, as it unspools a few dozen meters above their heads. Rely on it often enough for long enough, and you too may find — to paraphrase Edward Tufte — that the map organizes your London. For someone more than casually fond of both London and maps, it’s inordinately pleasing that these landmarks in cartographic history are all also part of the story of this particular place on Earth. You can go and visit the very places that John Snow and Charles Booth mapped any day of the week, using the system that Harry Beck described with his map. We are, however, safe in considering all of this history mere preamble, however glorious it may be. I believe that at this moment in time, we are collectively experiencing the most significant single evolution in mapping since someone first scratched plans on papyrus — for one relatively recent and very simple development, made possible by the lamination together of three or four different kinds of technology, has completely changed what a map is, what it means, and what we can do with it. Nothing in all my prior experience of maps prepared me for the frisson I experienced the first time I held an iPhone in my hand, launched Google Maps, pressed a single button…and was located, told where I was to within a very few meters. When you realize that, already, some 30% of the adults on the planet own a device that can do this, that this audience already greatly outnumbers all the people who ever consulted an A-Z, a Thomas Guide or a friendly green Michelin volume put together, you begin to understand just how dramatically the popular conception of cartography is evolving. Those who come after us will have a hard time imagining that there was ever such a thing as a map that couldn’t do that. The fact that such depictions can now also render layers of dynamic, real-time situational information — traffic, weather, crime and so on — seems almost incidental compared to this. The fact of locability, in itself, is the real epistemic break. It subtly but decisively removes the locative artifacts we use from the order of abstraction. By finding ourselves situated on the plane of a given map, we’re being presented with the implication that this document is less a diagram and more a direct representation of reality — and, what’s more, one with a certain degree of fidelity, one that can be verified empirically by the simple act of walking around. I’d argue that this begins to color our experience of all maps, even those that remain purely imaginary. We begin to look for the pulsing crosshairs or the shiny, cartoonish pushpin that says YOU ARE HERE. The ability to locate oneself becomes bound up with the meaning of any representation of space whatsoever. And it has profound pragmatic consequences, as well. It means that our maps can do real work for us. Typical of this is the online service Citymapper. Fed real-time information by TfL via a series of conduits called “application programming interfaces,” or APIs, Citymapper constitutes nothing less than a set of keys to the city, accessible to anyone with a smartphone and a data plan. It effortlessly tames what is otherwise the rather daunting perplexity of the street network, divining a nearly-optimal path through all those closes and courts and alleys, or suggesting just what combination of buses and trains you’d need to cobble together to get from, say, Stoke Newington Common to Camberwell Green. Again, here London is different from other places. Though Citymapper offers versions for New York and Berlin, Paris and Barcelona, the utility of each is hampered by the limitations placed on it by those cities’ respective transit authorities. In my experience, no metropolitan transit agency in the world provides APIs as robust and thorough as those offered by TfL, and as a direct result Citymapper and its competitors are more useful here than they are just about anywhere else. Happily, buses and Tube trains aren’t the only ways of getting around that are enhanced by the new interactive cartography. The networked maps so many of us now rely upon transform the practice of walking, too. The way in which access to real-time locative information enhances one’s sense of security in exploring the city is beautifully expressed by the London-based technologist Phil Gyford: “I can quickly see that my destination might be only 25 minutes’ walk away, and I know I’ll be going the quickest route, and GPS will ensure I won’t get lost halfway there. Somehow walking now seems more viable and less uncertain.” What this opens up, even for the longtime resident, is the prospect of exploring a city they never knew, though it may have been separated from them more by habit and uncertainty than any physical distance. Gyford now feels free to wander “the overlooked parts of London…the neglected seas between the Tube-station islands”; somewhere, the worthies of the London Diocesan Building Society breathe a sigh of satisfaction before returning to their deep slumber in the earth. That we are becoming — that some of us have already become — so intimately and thoroughly reliant on our maps to guide us safely through the urban thicket makes it more important than ever that we regard them critically. Though we know intellectually that the map is famously not the territory, the emotional truth of this can be harder to internalize; we’ve all seen news stories about truck drivers following their satnav directions straight into a lake, or a wall. We need to get in the habit of asking pointed questions about who makes the maps, who chooses the information that is rendered upon them, and where that information comes from in the first place. We might also attend to the deeper truths about the city we live in that are brought to light by this class of representations. Consider the dynamic visualizations of the Milan-based transportation-planning practice Systematica. In their time-series map of London, peristaltic pulses of expansion and contraction wash across the familiar terrain, revealing what we’ve always known to be the case: that at no hour of the day is the actual city coextensive with its formal, administrative boundaries. Though the human presence must still be inferred from these abstract surges of color, the message is unmissable: for all the grandeur of its physical fabric, the deep London is nothing more or less than the people who move through it, animate it and endow it with meaning. This, in the end, is not such a bad lesson to derive from contemplating the play of pixels on a screen. If, as the disgraced geographer Denis Wood puts it, all “maps are embedded in a history they help construct,” this is true of maps of this city more so than most. And if we know that London, this gorgeous hypersurface, is forever absconding from the knowable, and can never be entirely reduced to a set of lines and points and paths, this doesn’t necessarily imply that there is no point in making the attempt. Perhaps, as with those of John Snow, Charles Booth and Harry Beck, the maps of Citymapper, Systematica and their descendants may yet help bring a safer, wiser, more just and merciful city into being. Do you still speak to your no wave peers? Those that still live…Of course [I do]…Anyone, that’s still alive — I’m down, I’m here, hello. The drama had to do with the fact that this person, as charming and vivid and unique as he was, was not by any means always pleasant or even necessarily safe to be around. One or two members of the group apparently felt that saying so in so many words was somehow disrespectful of him, or diminished his memory, but I was gratified to see that the far larger number of people posting to the page did not. They apparently believed, as I do, that only the truth is love. But still more importantly, any attempt at sugarcoating that truth, or sanding away the edges of an uncomfortable reality, would have done a special kind of violence to memory. And when you’re talking about a shrinking group of people who collectively lived through a given set of experiences, that violence cannot easily be borne. Here’s what happens. The people who were there, whose corporeal memory enfolds some fragment of your shared lifeworld, they begin to drop away. And in time, the world fills up with people who, whatever their gifts and however beautiful they are, simply have no conception of what it was like to live in those days, materially, experientially or somatically. They just don’t share the frame of reference. So that connection you have with the dwindling number of those who do — well, when coupled to the natural deepening of personality that most of us seem to undergo, that connection comes to outweigh just about every other consideration. There are of course some things that shared bond can’t excuse, some acts that can’t be overlooked. But for the most part you find yourself warming even to the folks you outright despised back in the day. Whatever lay beneath the rupture between you — narrowly-defined and harshly-policed differences in taste or politics, sexual jealousy — it feels so petty and trivial and little when compared to the fact that suddenly seems kind of majestic, which is simply that you’ve both made it across this particular sea of time with memory intact. Anyone that’s still alive: I’m down, I’m here. Hello. Here I am in Seoul, and I’m fittin’ to go have a walkabout in Itaewon. When I first came to Korea some fifteen years ago, as a sergeant in the US Army, Itaewon was a rather tatty pleasure quarter outside the gates of the main US base, and with the base’s closure it’s now well on its way to becoming something else (though what that “something else” is is not quite clear to me yet, and may not be any clearer to the people who live here). At any rate, I’m going to go have a poke around for a good few hours, but then I’m more or less at loose ends until my very highly planned and scheduled time begins tomorrow morning. If any of my Korean readers happens to be free and you’re up for a chat over tea or a quick 맥주, let me know in comments here — I’ll be checking in at intervals. Oh man, this one has been a close hold for so long it’s a relief to just have it out there. I am deeeeelighted to share with you the news that I’ve been selected to receive the inaugural Mellon Fellowship at LSE Cities, and that Nurri and I and the excellent cat will be spending much of the next year in London. – and devise everyday technologies to support the open, tolerant, feisty, opinionated character we associate with big-city life, above all that quality variously described as canniness, nous or savoir faire. It’s going to be great. I am so very pleased and honored to be doing this, and I cannot tell you how much I look forward to spending more time with all the beloved on the other side of the Black Atlantic. I want to thank everyone at the Mellon Foundation and the LSE who have helped make this a reality, and, my word, Nurri for thinking this was an interesting way to spend her 2014…but above all dear Adriana Young, without whose active instigation and encouragement this never, ever would have come to pass.